Chris Halaska is a senior vice president and chief investment officer at Memorial Hermann Health System. Previously, Halaska had worked at J.P. Morgan for more than 12 years. Halaska holds a BBA in finance and an MBA, both from the University of Texas at Austin. During his four and a half years at Memorial Hermann, Halaska signifantly increased the system's investment exposure to private markets. In this interview, he discusses his insights on finding opportunities in the already crowded real assets and real estate space, as well as his strategy in addressing the high management fee challenge in private equity and hedge funds. Mr. Halaska was recently named on Trusted Insight’s 2017 Top 30 Hospital Investment Officers. He graciously spoke with us on January 26. Trusted Insight: In your last interview, you mentioned reconstructing asset classes to capital preservation, growth and real return. How are you looking to continue repositioning the portfolio going forward? Chris Halaska: We've refined our risk factor framework a little bit. We've added a diversifiers bucket and moved some of the assets that were originally in the capital preservation category into diversifiers. The investments that have been moved include non-directional hedge funds along with non-core fixed income. In terms of manager selection, we are trying to find managers who are off the grid a little bit. This is particularly important in with certain hedge fund and private strategies. Further on the hedge fund side, we are shifting the portfolio to more concentrated, single-strategy funds. Lastly, we have started doing co-investments over the past year. Trusted Insight: Can you tell me a bit more about co-investments? Chris Halaska: The way we do it is we have certain parameters in place. We don't try to evaluate every investment and say yes or no. If an opportunity comes up with one of our existing managers, and it fits certain criteria for why a co-investment is required, then we move forward. In other words, they're offering it as a co-investment for the right reasons, then we will proceed if we have the capacity and invest along with them. We do a little bit of individual work on the company or asset(s) but we're really relying on our partners for their expertise rather than trying to say this is a better co-investment than that. Our team didn't come from principal investing in energy, real estate or venture. It's hard to really do the job of the GPs' and evaluate one investment alternative versus another so we really rely on their expertise, and we like co-investments as a way to reduce the fees of our private portfolio. Trusted Insight: Real assets is quite an interesting area of development right now as the oil prices gradually going up again. What particular areas of real assets do you think are interesting currently? Chris Halaska: Energy private equity is tricky because there's a lot of money that's been raised in the last couple of years. I saw a statistic, something like $70 billion has been raised with large funds, and many funds are raising more than they've ever raised before. So there's a lot of capital -- both public and private -- out there competing for deals. I think more so than ever there will be winners and losers in that space because we may not be in an environment where skyrocketing energy prices can solve any kind of deployment issues. I think in the large-cap space, going with a firm who has a very long track record of expertise with the re-upping with the same management teams is pretty important, and I think we're focusing on firms that have been large for a while, not just ones that have grown dramatically over the last fund or two. We’re also looking at some of the smaller funds. Because of all the money chasing the big commitment dollars -- $400 or $500 million commitments to companies and to management teams -- there is less competition for funds who deploy smaller amounts of equity. On the real estate side, what we've been focusing on are, again, smaller and either geographically focused or property-type focused managers who have a particular expertise at creating value regardless of what cap rates are doing, through value add strategies. Trusted Insight: Do you think the two-and-twenty fee structure of private equity and hedge funds is sustainable? Chris Halaska: I think there has to be a lot of pressure from the industry to be able to change that kind of fee structure with hedge funds. Several well-known, well-performing funds have introduced different share class options where they have to beat a benchmark (or a hurdle rate) so it's not just zero to get their incentive fee. I think for hedge funds, having some kind of a bogey, depending on what type of strategy it is, that they have to exceed before they get their incentive fee would be great and it makes a lot of sense. The ones that have people lined up out the door to give them their money aren't going to have to do it but the ones who aren't fully closed and have more capacity may consider different options like that. On the private equity side, perhaps even more so than hedge funds the best funds are very difficult to get into as a new investor and they've been closed for quite some time, so I think they can charge whatever they want to charge. At the end of the day you evaluate returns on a net basis, after all fees. At least in private equity they don't get their carry until you get your preferred return so that's a little bit more reasonable. In other words, they don't get their 20 percent until you've hit your 8 or 9 or whatever the preferred return is. So they've got some implicit target they have to meet before they really get paid. Where as hedge funds at zero, I think that doesn't make as much sense. Trusted Insight: What investment trends do you see in health care systems comparing to your other types of investment models such as endowments? Chris Halaska: I think you're seeing more and more health care systems put the attention of the organization on the investment portfolio. It is in the biggest asset of most of these companies. For example, a health care system may have 10 hospitals. Each hospital might be worth two, three, four hundred million dollars but that system may have a $3 or $4 billion investment portfolio. So the investment portfolio is the single most volatile asset the organization has in a given year and I think more and more systems are appointing an engaged investment committee and hiring more people internally to oversee the portfolios. Trusted Insight: You had previously said before the election that you didn't see Donald Trump becoming the next president. Has your investment strategy changed under the new administration at all? Chris Halaska: It hasn't changed. Having a president who is for capitalism is good for investments, generally speaking, for the United States. The market is clearly reflective of that, at least in the last couple months since the election. You've seen interest rates go up so I think the likelihood of an inflationary environment is higher now than it appears to have been in quite some time. So we're thinking a little bit more about the positioning of inflation protection within the portfolio and investments that would have characteristics that could do well (or at least not so bad) in an inflationary type of environment. That's the main change we're thinking about. Trusted Insight: What kind of assets are you looking for in that respect? Chris Halaska: They're real assets, whether it's private real assets or public marketable real assets. Within marketable, you've got commodities, real estate, infrastructure, MLPs, et cetera. All of these (at least theoretically) should have some varying levels of correlation to an inflationary type of an economic environment. 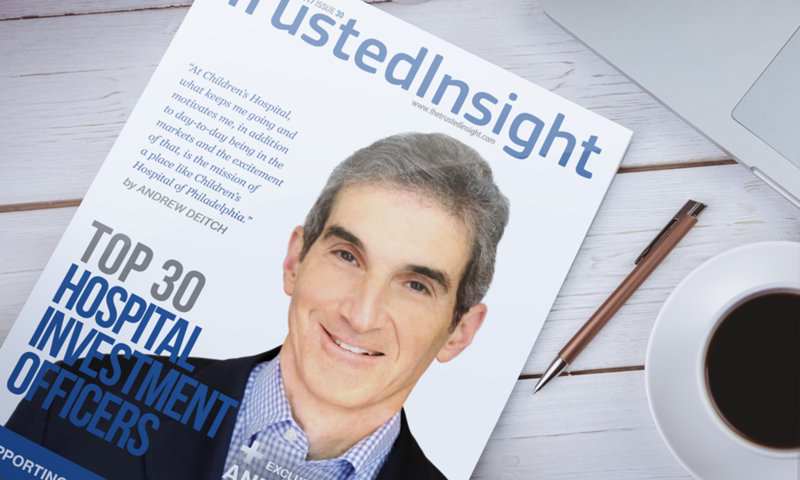 Trusted Insight: It seems to be a trend that health care systems are expanding their internal investment teams. Memorial Hermann only has a small team of five. What opportunities and challenges does a small team present? Chris Halaska: I think if you've got five to ten people which is kind of where we are and where many of our peers are in the $3 billion - $5 billion AUM range, you can't be experts in everything. In other words, like I said as it relates to co-investment, I don't have someone on my team that's a pure real estate expert. You've got to learn about more things than you would if you were on a bigger team where you could specialize a lot more. You get exposure to more but you can't go quite as deep as you can when you're on a very large team with a bigger pool of assets. Trusted Insight: Many of the chief investment offices are struggling to find and retain talented investors in the current environment. Do you see that as a problem? Chris Halaska: Yes, it is something that is always an issue and probably no matter what industry you're in or what you do. I think the right way to do it if you can is to have an organization that understands what you're doing and is supportive of it and is willing to create the right incentives to align the interest of the investment office with the performance of the portfolio. If you can get all that right then you should have a good structure and a good opportunity in place for people at the varying levels within your investment team. Trusted Insight: What is the most rewarding aspect of being a chief investment officer? Chris Halaska: What I enjoy most is creating excess returns over a benchmark, which is really one of the main reasons for having an internal investment team and investing with active managers. At a health care system, that money created by the excess returns goes directly towards patient care and getting back in the community to serve patients in the way we provide our health care. Doing what we do, if you can generate a reasonable amount of alpha on a few billion dollars, that's a lot of money every year that otherwise wouldn't be there if you were just passive investors in the market. Being a finance guy, a numbers guy, creating those excess returns that translate into real money that the system can then use for good, serving its mission, I think that's what I enjoy the most. To learn more about health care investing, click here to view the complete list of 2017 Top 30 Hospital Investment Officers.